Former two-division UFC champion Conor McGregor is ready to resume his career with a targeted return date in July. That’s what the Irishman said this past weekend while touring the United States in anticipation of St. Patrick’s day where he celebrated in both Boston and Chicago while promoting his whiskey brand Proper No. 12. According to McGregor, he’s currently in talks with the UFC on a date, location and opponent but it appears he’s targeting July as the timeline for his next fight. July would be International Fight Week, which is always one of the marquee events for the UFC each and every year. McGregor has fought on those cards previously and it seems that would be the biggest possible date for his return out of any of the currently scheduled events on the UFC calendar. There is still no word on McGregor’s opponent after a fight with Donald “Cowboy” Cerrone seemingly fell apart when the UFC wanted them to serve as a co-main event on a card. McGregor, who is the biggest draw in the history of the sport, reportedly shot down that idea. 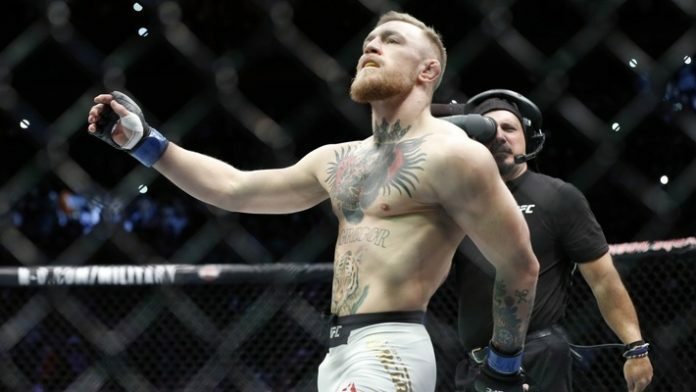 No matter who he faces, McGregor will obviously look to get back in line for a title shot as he hopes to avenge his last defeat against Khabib Nurmagomedov from last October. As far as the work he’s doing in the States, McGregor is not only promoting his whiskey but he was able to attend an event where he helped honor first responders, which has become a cause close to his heart in recent years. McGregor’s whiskey brand donates $5 of every case sold up to $1 million annually to first responders around the globe. “We had an event for the first responders and we’re giving back to the first responders,” McGregor stated. “These are the people that run into buildings as we are running out. These are the proper heroes. So for me to come over here to go to an event to support these amazing, amazing people and meet them, hear their stories.